It’s the oldest French scientific institute based in a foreign country and the first archaeological institute that was established in the Greek capital. The French School of Athens was founded in 1846 by order of King Louis-Philippe, amid the wave of French philhellenism which followed the birth of the modern Greek state a few years earlier. The Athens-based school has a long history that is closely connected with the growing interest in Greek archaeology and the excavations of key archaeological sites, covering virtually all historical periods. Most people probably already know of the excavations at Delos, Argos, Philippi or Malia. However, the one on Thasos, an island in the northeast Aegean Sea, is no less important. Thasos used to be among the 10 most powerful cities of the ancient world and was rich in marble quarries, gold mines and pottery workshops. Early digs in 1911 revealed parts of the ancient city walls, the port (which was used by the navy as well as merchant ships) and the agora (the ancient market). Archaeologists have also unearthed the island’s ancient political, administrative and religious center, a theater and entire neighborhoods that survive in relatively decent condition. 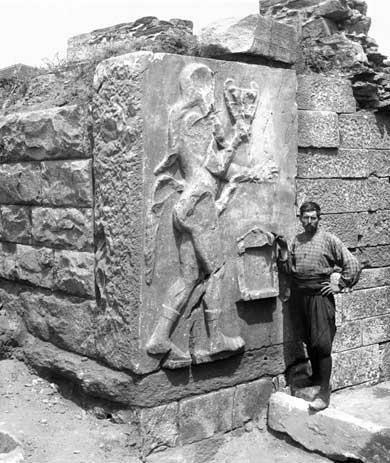 Silinos’s Gate is seen in a photograph from 1913. Many of the sculptures and inscriptions discovered at the time are now on display at the Louvre in Paris. The Thasos antiquities are the subject of an exhibition at the Archaeological Museum of Thessaloniki. Titled “100 Years of Excavations on Thasos by the French School of Athens,” the show is organized in collaboration with the 18th Ephorate of Prehistoric and Classical Antiquities in Kavala, northwestern Greece, and will remain on display through the end of August. The organizers are hoping to draw attention to the Athens-based school’s multifaceted activities over the past century and at the same time highlight some of the finds that have been brought to light over that period. It is important to note that the digs began when the island was still under Ottoman occupation and they are still ongoing. The objects on display are rather small in number -- the Kavala ephorate has provided 18 artifacts on loan from its collection. All of them were found during excavations carried out by the French School of Athens. Among them, perhaps the most striking item on display is a 5th century BC inscription found at the site of the ancient agora. It carries the names of inspectors and market regulators. There is also an archaic terracotta acroterion in the form of a Gorgon and clay figurines, as well as a large number of offerings that were collected from the island’s sanctuaries. The photographs and texts that feature in the exhibition are divided into thematic units that include the activity of the francophone institution, the experts who have worked on the island, and related documents produced over the past century. Visitors can learn about past excavation works on monuments and sites such as the walls and the acropolis, the agora, the sanctuaries, the neighborhoods of the city, the necropolis, the pottery workshops and the mines in the countryside. There will also be screenings of a film about the history of the island and its role during antiquity. “This exhibition must be viewed as a whole. It does not prioritize specific exhibits over others because everything, together with the photographs and the historical records, is used to create a narrative,” Eleftheria Akrivopoulou, an archaeologist working at the Thessaloniki museum, told Kathimerini. The exhibition does more than just shed light on the history of the island. It’s also a tribute to those who have taken part in the excavations carried out over the past 100 years: archaeologists as well as researchers from across all fields, both Greek and foreign, and other staff such as security guards. Black-and-white snapshots of ordinary people that lent a hand during the digs are displayed next to historical pictures depicting landmark moments in Greece’s history.